I had my coming out party this weekend! My Auntie Chris and Audrey invited me to their St. Patrick’s day party but I went thinking it was for me. Chris and Audrey wanted to meet me and Mom wanted me to meet their 3 cats Doc, Bashful and Thomas O’Malley. Doc was not feeling too well and Bashful was not crazy about puppies so here I am with Thomas. I was trying to get him to play but he wasn’t all that interested. 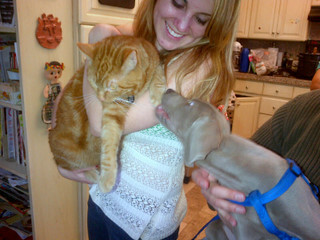 It was a fun party and I liked the humans more than the cats since they were all oohing and awwwing over me. I heard a few people trying to give my Mom and Dad tips on how to get me to behave better – not sure what that was about since I’m fine the way I am but these humans try to make me behave and use the controller leash. Hopefully they will grow out of it and remember I’m just Puppy Perry and all I want to do is eat, play, sleep and chew…. ← These Strange Things that Mom and Dad Do! T’was our honor to host your Coming Out, Perry! St Patrick’s Day will always be a little more special now.